European shares end the session mostly higher. German Dax lags. The US stocks, end the session higher propeled by higher financials, energy and technology shares. Boeing (transportation) were lower with Boeing subtracting 40+ points from the Dow by itself. Nevertheless, the major indices rebounded from negative levels reached at midday (after a higher opening). European shares are also ending the day with gains (the exception is the German Dax which fell by -0.25%). Below are the % changes of the major US and European shares today. In the US debt markets, yields are ending the session with gains with the shorter end moving up the most (flatter yield curve). 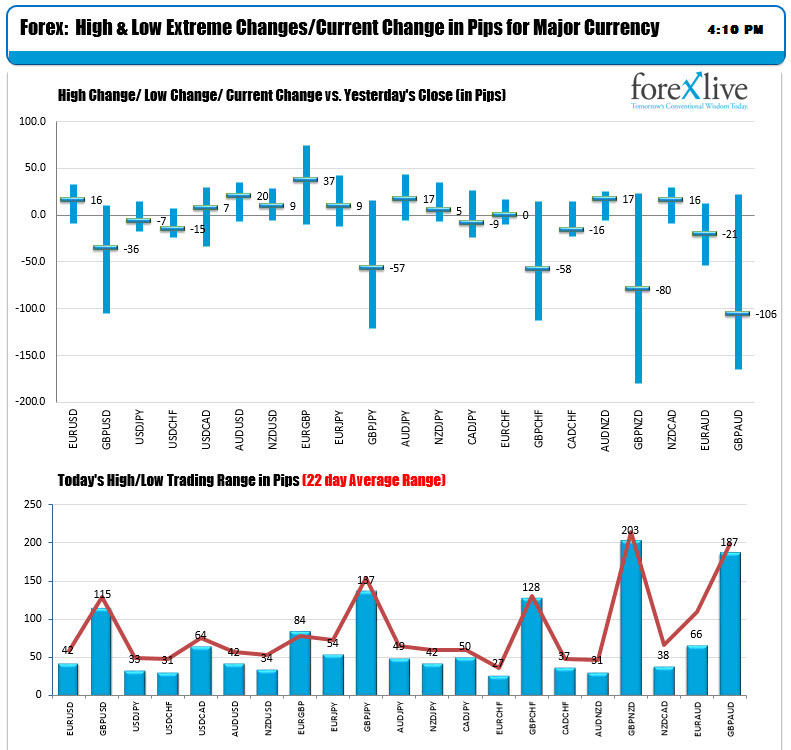 In the forex, the price action was up and down but for most of the pairs, with most ending the day not far from the prior day closing levels. Fundamentally, there was no economic releases to speak of. THe USDJPY, USDCAD, and NZDUSD are all trading under 10 pips from the closing levels near the end of day. 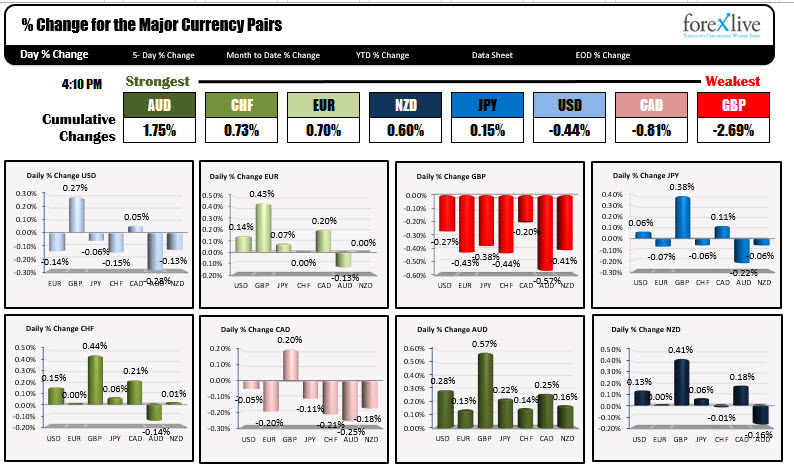 The EURUSD, USDCHF and AUDUSD are trading within 10-20 pips. The only pair vs the US that was more than 20 pips from the Friday close was the GBPUSD. The GBP is also the weakest currency of the day (while AUD was the strongest). That pair is closing down -36 pips at 1.3251, but is also well off the lows of 1.3183 reached in the NY morning session ON that break, the price fell below its 100 hour MA at 1.3220 and saw stops on the break. However, less, than hour later, the price was back above the MA and moved to a NY afternoon high at 1.3259. The EURUSD had a down up and down and up again trading day. The "down" reached down to a trend line connecting the low from March 7 with the low from March 15th. That line held. In the new day, the trend line will be a barometer for bulls and bears. Stay above it keeps the bulls in control, but a move below would be more bearish. The USDJPY fell below its 100 hour MA at 111.478 and the 200 hour and 200 day MA at 111.428. The pair did stall the fall near the 100 day MA at 111.317. If the price can stay below the 111.478 sellers remain in control with more selling potential on a break of its 100 day MA at 111.317. The NZDUSD dipped below its 100 hour MA at 0.6845 in both the Asian and NY session. Each fall failed, however and the price is trading up to 0.6854. Until that 100 hour MA can be broken, the sellers remain more in control. Good fortune with your trading.